Artificial grass, we feel, is one of the fastest growing markets in the UK, and more and more people every year are turning to it in order to get a garden which looks good all year round. The fact that it requires very minimal maintenance and resists the worst of the British weather, too, probably contributes to that! But the garden isn’t the only place that our artificial lawns are ideally suited for, and we feel like we should give a good old fashioned mention to the potential applications of our grass within the boundaries of sports. The most prominent role that artificial grass can fulfil is that of a playing surface, providing a base which is perfectly suitable for every sporting activity you could want to carry out upon it. Golf might immediately spring to mind, and you wouldn’t be wrong in imagining we’re able to create the perfect putting green either indoor or outdoor. 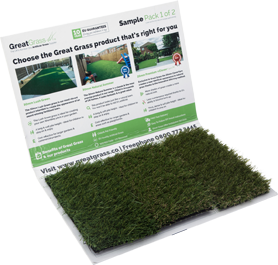 Typically that job is given to our fantastic 16mm Polypropylene artificial grass surface, a firm short-pile product which imitates a natural putting area as accurately as any purist could hope, but it’s far from the only sports grass we’re able to offer. With a highly adaptable design and the possibility to tweak our products in order to bring out certain qualities such as ball roll and bounce, we have a whole range of artificial grass surfaces which can form either efficient tennis courts, or perfect pitches for football, cricket, hockey, and even bowls! We can even tweak the colour of the grass, making it a perfect match for those appropriately lively courses seen so often in crazy golf. If you know what sport you’re looking to accommodate but you’re not sure what kind of grass to go for, don’t worry! Here at Great Grass we are the largest artificial grass suppliers in the UK, and alongside a wealth of experience we also possess a huge store of knowledge when it comes to our trade. For the highest quality golf and sports surfaces that are sure to last, simply get in contact and we’ll be able to discuss how best to meet your every requirement. We hope to hear from you soon!